Matthew Rogers argues for more emphasis on refugee integration as a driver for community empowerment and explains why now is the time for long-term solutions. Ashley Community Housing works closely with ‘hard-to-reach’ individuals, such as refugees, enabling them to integrate into the communities where they live. The Empowered Communities in the 2020s research is important to us because we believe that refugees not only empower communities, but are assets to them. We work with our local communities to rehouse refugees, provide training and enable them to find employment and become independent. In a fractured post-Brexit society, it is clearer than ever that we must pull together as communities in order to affect positive change, success and community solidarity. This possibility is adversely affected by the integration challenge faced by many of the UK’s major cities. The recent report by Dame Casey on Integration highlighted this challenge by stating that our major cities are like “communities living among communities.” It is support and training on integration that will help communities become more empowered in the future. We are currently facing the most serious refugee crisis in modern times, with more people displaced than since the Second World War. Too often the refugee issue is portrayed as a burden to society and at best, a humanitarian and charitable issue. The existing model fails to sufficiently recognise that refugees have talents, skills, and aspirations that will boost our economy and enrich our communities. A rethink is urgently needed, and the Empowering Communities in the 2020s research is a great step towards proving how a diverse community becomes empowered. We should be looking for a long-term approach to refugee resettlement and integration into communities. Refugees are more than just a charity case to be pitied – they are talented, skilled and motivated individuals, who are assets to any community. We believe that instead of communities turning away refugees, thinking that they will be a disadvantage to them, it is time to change the discourse to show that investing in the skills, enterprise and networks of refugees is an advantage to all. This is the message behind our #rethinkingrefugee campaign. The key principles of this campaign are economic, civic and social integration. This can be achieved through culturally sensitive support, training and sector focused employment skills. If more communities and individuals rethink refugees as valuable assets rather than them being helpless and needy, then we will start to see the integration of refugees helping to empower communities and benefit everyone in the long run. An example of a great success story at Ashley Community Housing comes from Fahd and Keysa. They are both Somali nationals and when they arrived in the UK they had a goal to set up their own maintenance business. Data from the Australian Bureau of Statistics shows that refugees make twice as much money from their own businesses as people arriving on skilled and family visas. However, Fahd and Keysa were turned down for finance by their bank when they asked for a loan to buy a van and tools in order to set up their business. Ashley Community Housing helped them to find a suitable loan provider which allowed them to start their business. Fahd and Keysa have more than 10 years’ experience between them in both electrical contracting and carpentry; they maintained more than 50 houses for ACH as well as offering their services to private residences and home builders. "Fahd and Keysa will flourish and will be an asset for us and the community at large; they are an example of a business in the Somali speaking community that have real talents in the electrical and carpentry trades and they are role models to lots of disadvantaged young people" – Mahmoud Matan, Training co-ordinator for Ashley Community Housing. This story just proves that with the right guidance and confidence, refugees can flourish in their communities, and that they bring diversity and valuable skills that helps to empower and enrich these communities. 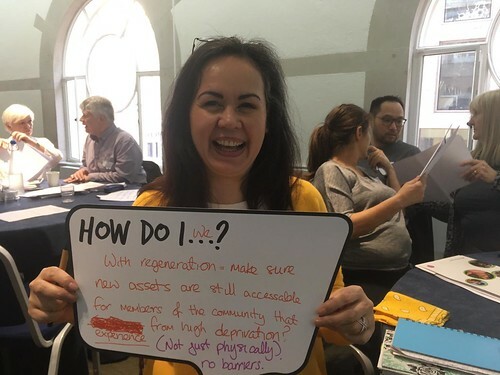 To find out more about the work of Ashley Community Housing visit, follow @AshleyCHousing or join in the #rethinkingrefugee conversation on Twitter.